Where do I use my Drainage Superstore voucher code? Drainage Superstore stock a selection of over 18,000 drainage products from huge brands in the industry. These products include underground drainage, manhole covers, building drainage, roofline drainage, channel drainage, plumbing and heating, landscaping, sewage treatment, waterproofing solutions and tools and accessories. 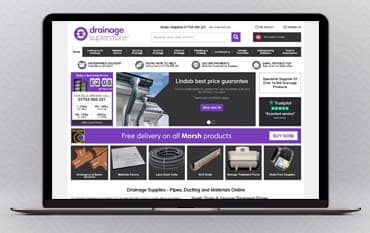 Whether you’re looking for plastic, stainless steel or cast iron drain pipes, ducting, surface water management, cladding, plastic, metal or cast iron guttering, shower and wet room fittings, grates, flood defence products or more, you can find it at Drainage Superstore. If you’re looking for discounted products then make sure you check out the clearance section. The clearance section provides manufacturers with an outlet to sell off the end of line stock, excess stock or items they want to offer a promotional price on. This section is constantly changing as new products become available or the stock is discontinued so make sure you check back regularly to find great savings on your drainage products. Drainage Superstore offers the full range of Lindab Rainline rainwater systems and Brett Martin Cascade, cast iron style guttering- two favourites in the drainage industry. They also ensure they provide for all types of projects with impressive Coppa Gutta for the ultimate unique aesthetic, Brett Martin’s round style guttering for fantastic value for money as well as other high-quality rainwater systems and complimenting gutter brushes. Shop for plastic, zinc and stainless steel guttering as well as roof outlets in all shapes and sizes from market leading manufacturers like ACO, Caro and Blucher. You can also find temporary downpipes, guttering screws, cladding, rainwater tanks and much more. Drainage Superstore supply a comprehensive range of soil and waste products including push fit soil pipes, push fit waste pipes, solvent weld soil pipes and solvent weld waste pipes. You’ll also find an extensive range of universal overflow, compression waste fittings and external air admittance valves from huge names like Floplast and Brett Martin Plumbfit as well as flexible plumbing systems used by professional plumbers for many plumbing and heating applications. If you’re looking for stainless steel commercial gullies, industrial steel gullies or ventilation options you can also find all this from leading manufacturers like ACO, Blucher, Lindab Indomo and Ubbink. Delivery charges are all included in the final price of the products displayed on the website. How can I contact Drainage Superstore? If you’d like to return a product, you must either post it to this address: Burrington Way, Burrington Business Park, Plymouth, PL5 3LX, email sales@drainagesuperstore.co.uk or give the customer service team a call on 01752 692 221 for a return label or arrange collection. Drainage Superstore provides the best range of above and below ground drainage supplies as well as other associated products like ducting, gas coil pipes, tube gullies and hoppers from leading manufacturers in the industry. Draining Superstore’s vast online range of draining products includes drains, sewers, surface water drainage, rainwater harvesting, manhole covers, and flexible couplings. All these products are supplied at a great price from big brands like Brett Martin, Clark Drain and Flexseal, and then delivered to you at an even cheaper price. And, if you’re looking for the best price possible on your drainage supplies you can also use a Drainage Superstore discount code from us to save even more on your order.